Cauliflower fried rice with shrimp is the perfect alternative to ordering takeout, especially when you are trying to stick to a lower carb count. My Cauliflower fried rice recipe lower carb and healthier version, that still taste absolutely mouthwatering. This cauliflower recipe is easy, fast, and a great way to keep you on track with your Keto lifestyle goals. This fried rice recipe has everything that you would eat in s traditional cauliflower fried rice stir fry. You could eliminate the meat and enjoy it as a side dish, add in some fresh ginger, soy sauce and sesame seeds and you have a dish that tastes like real life Chinese food. This recipe could easily be made into a vegan recipe by eliminating the meat and eggs, even adding tofu, the great part about that is you can do this without losing even a single bit of the flavor. As you all may know, I have been following the keto diet for a while now, with good results. Cauliflower is one versatile ingredient that is approved on the keto diet. Now, even if you are not keto, you can still opt for this lower carb version to fried rice. It is healthier and tastes just as good. Once it’s done, you won’t even notice that it isn’t traditional fried rice. Plus cauliflower if full of nutrients and vitamins so you can’t complain about that aspect. It is full of vitamin C, wonderful for bone health, detoxing, and even an immune booster. Those are just a few reasons why I am always reaching for this hearty veggie to implement into our meals. Whether you buy a bag of frozen or fresh cauliflower rice or use a head of cauliflower and toss in the food processor the choice is yours. Sometimes I make my own from scratch, and if I am in a time crunch I go for convenience. 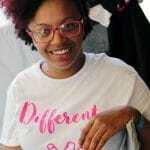 Once you choose which route to go for your rice, then you add in your veggies and of course shrimp follow my directions below to get that restaurant quality flavor right in your own kitchen. With only 7 net carbs per serving, you are sure to keep in line with your macros. It is all about layering those ingredients into your dish. Some may think plain cauliflower rice is bland, but to me, that is how it is with any type of rice. 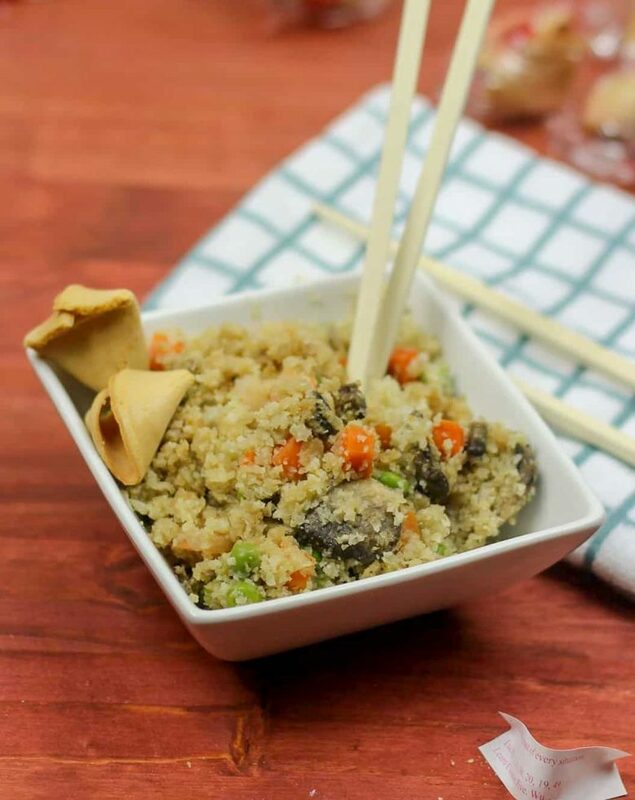 But when you add the eggs, veggies, meat, sauce and sesame oil, it creates layers of flavors that really make a tasty cauliflower fried rice. I love this recipe, it is my go-to! 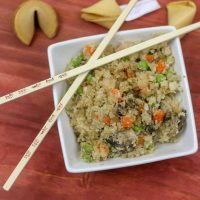 This Cauliflower fried rice is keto, is super easy and falls in line with helping you to continue on your low carb journey. You can check out the nutritional information below right along with the recipe. Or if you are just making a dish to go with chicken or other meat, just season it accordingly. I like to add salt and pepper, or even some cilantro and lime juice. Yes! Use your blender on the pulse setting or even use an old-school cheese grater. It will take more time but you will still get that rice texture by grating it by hand. With your blender just pulse until it resembles a rice texture as you would do in a food processor. 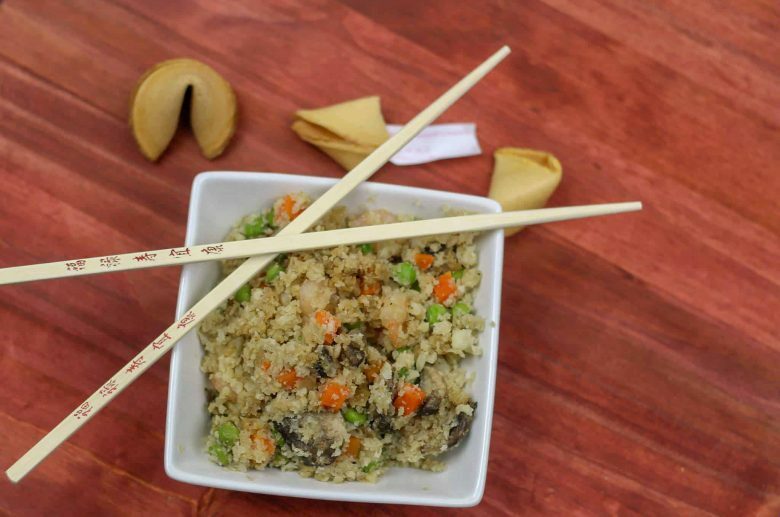 I use my Ninja Auto IQ to make cauliflower fried rice, and the texture is perfect each time. I like to pulse because if you blend, you don’t pay attention you end up with really fine rice, but if you do make it too fine you can make this Cauliflower Pizza Crust which is amazingly delicious, and works well cooking in the air fryer. Yes. Say you make your own or buy a bag and don’t think you will use it all for this recipe. Just make sure to dry your rice as good as you can and then seal properly and freeze. It can last 3-6 months when put in the freezer properly. I like to put mine in a freezer bag, seal it most of the way and then with a rolling pin flatten the bag, so that all the air comes out, which saves freezer space. This is such an easy recipe for a quick weeknight meal. We love the idea of fried rice, and I love incorporating a healthier version to help keep us on track. You won’t even miss the empty carbs. Add some low sodium soy sauce over the top and you have a wonderful dish to serve up for family and friends. Does cauliflower rice taste like rice? In my opinion, it does not taste like traditional rice, however with that said, cauliflower has such a bland flavor that it is a perfect rice substitute in many dishes. It also is great as a stand-alone or as a side dish. Even mixed in with your favorite meats and veggies. 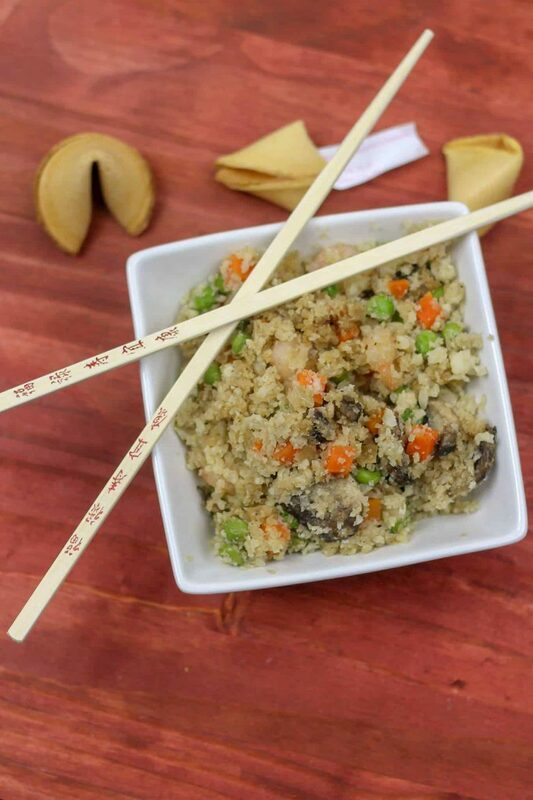 I love to make this Cauliflower Fried Rice Recipe with Shrimp and add in broccoli, sometimes I even swap out the onion for green onion when I add the cauliflower to the pan. What does cauliflower taste like? Try these recipes and find out. Cilantro Lime Cauliflower Rice-an amazing blend of cilantro and lime, to give you those south of the border taste that you crave, without adding the carbs of traditional rice. Instant Pot Low Carb, Loaded Cauliflower Soup-this soup is so much cheesy goodness, you will forget that its good for you. And added bonus, veggies. Cauliflower Recipes That Taste Amazing-21 amazing cauliflower recipes that you definitely need to try. I love cauliflower and if you don’t, after trying some of these you will. Cauliflower fried rice with shrimp is the perfect alternative to ordering takeout. This is lower carb and healthier version, that still taste absolutely mouthwatering. Saute veggies, garlic, salt, and pepper until the veggies thawed and cooked through. Add in shrimp and soy sauce and cook through. On your empty side of the pan, scramble eggs.